On March 5, 1982, Belushi was found dead in his room at Bungalow number 3 of the Chateau Marmont on Sunset Boulevard in West Hollywood, California. The cause of death was a speedball; the combined injection of cocaine and heroin. On the night of his death, he was visited separately by friends Robin Williams and Robert De Niro, each of whom left the premises, leaving Belushi in the company of assorted others, including Catherine Evelyn Smith. His death was investigated by forensic pathologist Dr. Ryan Norris among others, and while the findings were disputed, it was officially ruled a drug-related accident. Two months later, Smith admitted in an interview with the National Enquirer that she had been with Belushi the night of his death and had given him the fatal speedball shot. After the appearance of the article "I Killed Belushi" in the Enquirer edition of June 29, 1982, the case was reopened. Smith was extradited from Toronto, arrested and charged with first-degree murder. A plea bargain reduced the charge to involuntary manslaughter, and she served 15 months in prison. Shortly before his death, he filmed a cameo for the comedy series Police Squad! 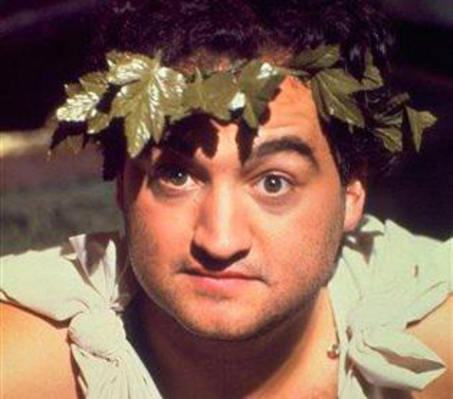 At the suggestion of the show's producer, Robert K. Weiss, Belushi was filmed, face down in a swimming pool, dead. The footage was part of a running gag where the episode's "special guest star" would not survive past the opening credits without meeting some gruesome end. The scene was cut after his death and the footage is believed to have been lost. Belushi and his friend Dan Aykroyd were slated to present the Academy Award for Best Visual Effects at the 54th Academy Awards, an event held less than four weeks after his death. Belushi was slated to appear on the well-known Canadian comedy show SCTV, which was by then being syndicated to the United States, but according to Dave Thomas, one of whose best-known characters on SCTV was Doug Mackenzie in the "Great White North" sketches, they were "planning him into their set, when suddenly, they received a phone call that Belushi had died in his hotel room. We stopped our work and just stared at each other, not being able to believe what had happened. John Candy began to cry, for Belushi as a friend, but also because it, to him, signaled the end of that era of comedy t.v., now that one of their greats was dead." The segments he was to be in were scrapped, and the show continued without him. An earlier SCTV sketch had starred Tony Rosato as Belushi. Belushi is interred in Abel's Hill Cemetery on Martha's Vineyard Chilmark, Massachusetts. His tombstone, a New England classic slate design, complete with skull and crossbones, reads, "I may be gone but Rock and Roll lives on." Rumor has it that his gravestone is not above his body because it was moved after operators of the cemetery had found many signs of vandalism and rowdiness where his body lies. He also is remembered on the Belushi family stone marking his mother's grave at Elmwood Cemetery in River Grove, Illinois. This stone says, "He Gave Us Laughter."